Regular professional cleaning is important to maintaining your pet's teeth. Without proper dental care, bacteria and plaque begin to buildup on your pet’s teeth, hardening into tartar which causes gingivitis, receding gums, and tooth loss. If left untreated, dental disease can lead to severe pain, oral infection, and even infections within your pet’s organ systems. We use modern and safe ultrasound to clean each tooth thoroughly - above and below the gum line. Dental technicians polish teeth to create a smooth, lustrous tooth surface more resistant to plaque buildup. Fluoride treatments help strengthen enamel and reduce tooth sensitivity. Advanced dental care is available, including root canals, caps and braces. In addition to our professional dental exams, we strongly recommend regular at-home dental care to prevent the buildup of plaque on your pet’s teeth. Brushing your pet’s teeth on a daily basis will reduce or eliminate plaque buildup. Periodontitis is caused by plaque buildup, which causes, inflammation, pain, and infection. If periodontitis is left untreated, it will begin to loosen and destroy the teeth and bones over time. 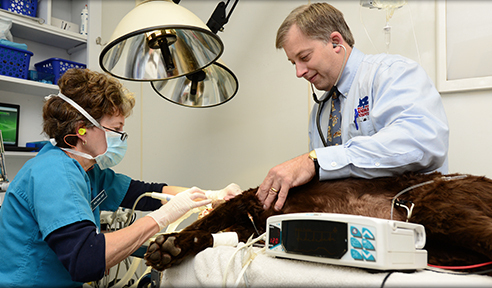 If your pet exhibits any of the signs of dental disease, please call us today at 615-352-4370 to schedule a dental exam for your pet.